This seems to be a pretty stupid question... I got a 2nd hand Blitz filter that I need to install. I tried to fit it on Sunday, but the battery in the car is much too large (including the hold-down bracket) to allow it to fit. 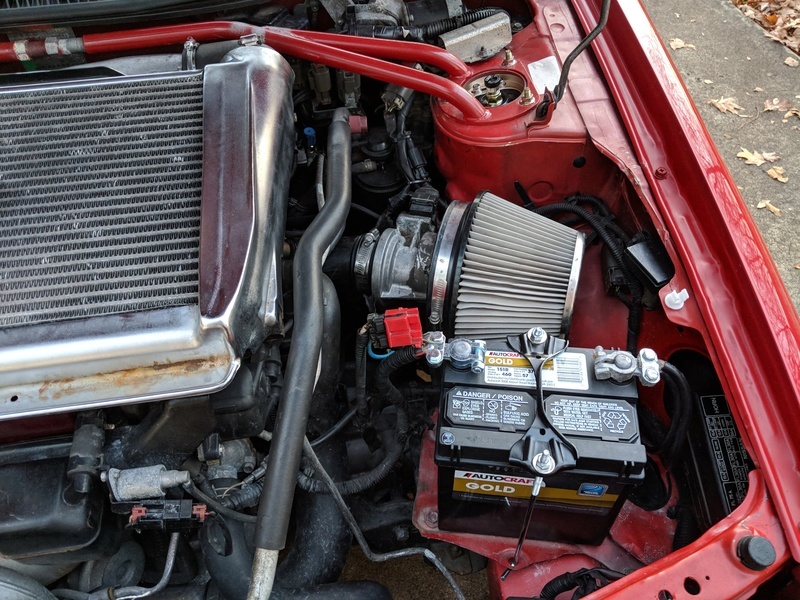 I got a new battery (original JDM size) and an OEM hold down bracket, so I am going to have another run at it tomorrow. The stupid part of the question is, how does the bracket (support arm?) install? 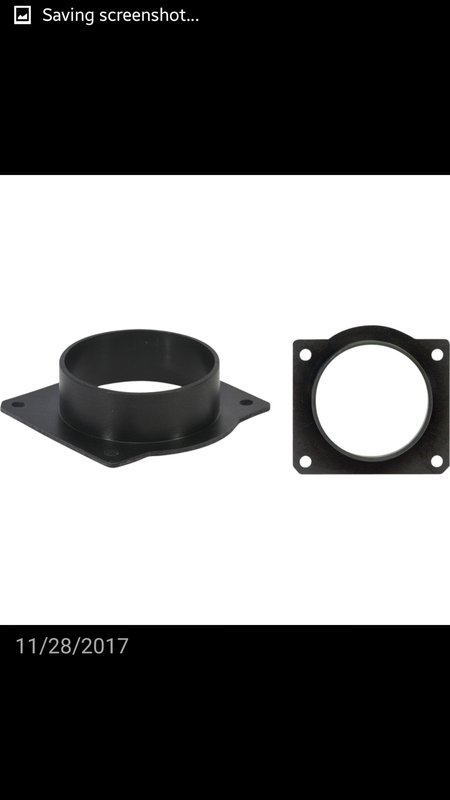 I could not get the holes in the bracket to line up with the holes on the filter/MAF. It looks like it might line up if I turned the MAF 90 degrees, but when I look at pictures of other people's engines with them the plug (wiring) seems to be in the same location as mine. What am I missing here? 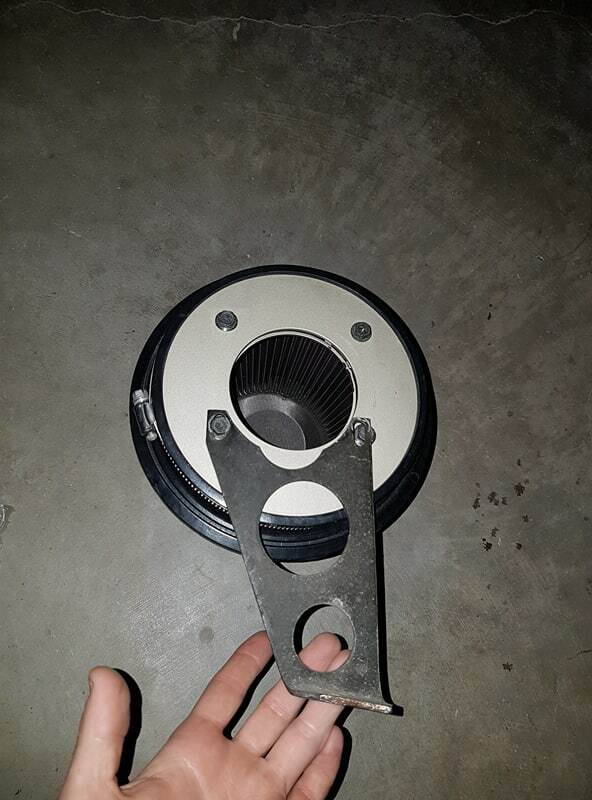 I assume the bracket bolts to the threaded hole directly under the filter (there was a support bracket bolted to it for the filter that is in there now)? Should I rotate the MAF so that the plug is on the bottom side (this should allow the bolt holes to line up with the bracket underneath)? This is what I am talking about. When bolted to the MAF in my car, the holes that are closer together are the ones at the bottom. The bracket fits the ones that are farther apart. Shouldn't you have an adapter? The thing with the four bolts in it is the adapter. It bolts to the MAF and the filter fits over it with a clamp around it. The opening for the Blitz filter is HUGE compared to any others I have seen. That is the second part to my question. It looks like it should bolt to a hole that is directly under the MAF. The current filter/adapter that is on there has a small bracket that is currently bolted to that hole with a 10mm (M6) bolt. It really looks like it needs an additional adapter like what Stu posted? Get rid of that bracket I used a straight piece of metal drill a hole either end one to go on the maf and the other to go on the floor at the back of the battery and just bend the metal at the bottom end mine was very tight don't think I had any other adaptors?? Thanks guys. Definitely no other adapter needed, as the part with the bolts in the photo is the actual adapter. It bolts up well. I think I will take Bebb's idea and just use the bracket that is on the filter in there now. I know it bolts up, and will serve the same purpose. It just does not look nearly as nice (or sturdy) as the one that came with the Blitz. Perhaps I will just give it a coat of paint to spruce it up a bit. Perhaps it is supposed to bolt to the original battery cover (which is missing in my car)? At this point, I think using the home-made bracket in the car now will be easier and should do the job. New battery and filter fitted. Just used the existing bracket, as mentioned. Looks like there is still room for the factory battery box as well (have one on order).